the boudoir. : Frizz! Police! Don't Move! My hair is naturally curly and there was a time when I used to get out of the shower, towel dry it, and go out. Everyone loved it that way. But I grew bored and got back to straightening it, and sadly I got hooked on the straightening iron. I couldn't live without it! Together with coloring and highlights, my hair was so damaged and dry,it was impossible to go natural. It was so frizzy and dry with flyaways! I hated it! Until now! 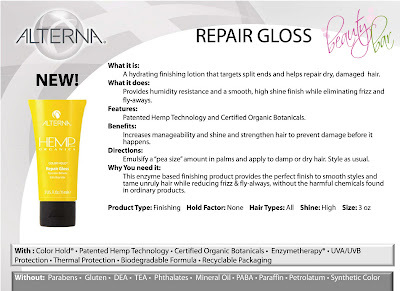 Just in, in Beautybar- A Modern Apothecary, a Kuwaiti beauty online store, is Alterna's Hemp Repair Gloss. This is the first product that I ordered from the store and I'm glad I did. My hair was calling out for help and was in need of a break from all the heating tools that were killing it. Alterna's cream targets split ends (YAY!) and repairs frizzy dry damages hair (double YAY!)! My curls look gorgeous, more defined now, my sister keeps telling me "don't ever do straight or wavy again"! I think my hair just needs to get a little longer so it'd look even better. But seriously, the repair gloss is like magic. I think I'm going to order more of the product just in case it goes out of stock. What more? Beautybar's bag was filled with Alterna products test samples and other goodies I loved. That way I can try their stuff and know for myself what suits me rather than randomly ordering. Thanks you guys! By the way, the online store does deliver to countries from the MiddleEast region. Oooh looks good.. Have you tried Sebastian's Potion 9 ? Not in Kuwait, US and probably UK..
Its really good for curly hair,, its the latest craze I guess. It gives great texture and all. My hair is wavy, though, but still I know a lot of girls with curly hair and they swear by it. im actually blow drying/ iron straightening my hair is very min.. and i was actually thinking about telling you to write about keratine and other hair straighting treatments.. im sooo bored and tired of straightening my hair.. not that its that curly but i just look better with smooth hair.. but now that informed us about this product im so getting.. one of the products i use before any heat encounter is Lee Srafford's flat iron protection mist.. not only does is smell great but it really helps smooth out the hairs and give this healthy glow to it.. i really suggest you try it ..its sold at boots ..